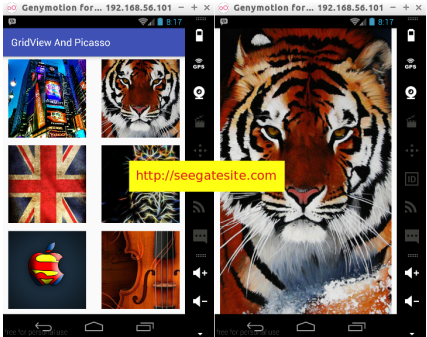 Seegatesite – back again on android tutorial article, this time I will share about gridview and Picasso in particular how to display images on android gridview from url using Picasso. There have been many technology sites that share a way of displaying the image on gridview and use picasso, hopefully that will be my way for it suits you. What is a Picasso library ? Picasso is A powerful image downloading and caching library for Android. So using Picasso will be easier for us to display the picture in the android image view. Handling ImageView recycling and download cancelation in an adapter. Complex image transformations with minimal memory use. Automatic memory and disk caching. 2. Create a new android project as GridViewPicasso. 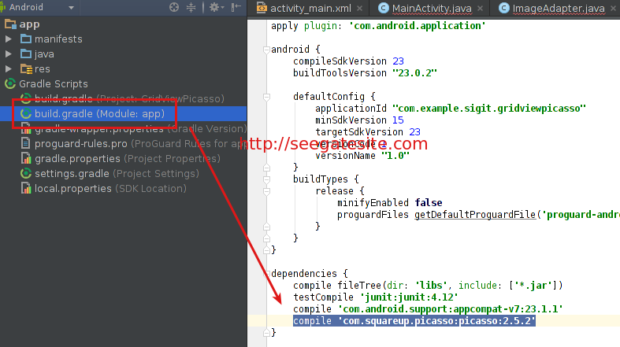 Please read the Introduction Android Studio for Beginners to create new android project. We create gridview layout with 2 columns every row, if you prefer create more column, change the numColumns number. * Created by sigit on 26/01/16. 11. Run app and finish. Applications will load the image from the server, then the entire image is displayed in the gridview layout, when the image is clicked it will go to a new activity (fullimageactivity.xml) which will display full size image. For the development of the project, we can add a download images button and xml parser to retrieve image data dynamically. how to correct the mistake? What am I supposed to do if I don’t want the images to resized on the first page,I guess I just need to edit the xml file? Pls tell me if it’s correct since it is part of a course project. this code work.but i have confusion that how to share the selected full image to other app like whatsapp,gmail,message and other sharing app.